14 cars took the grid for the great race. Track conditions were what you would expect from a track under water on Wednesday. "Exciting" would be an understatement. Both ends were challenging though much of the action was in Pit Bend as cars bicycled and performed wheelstands throughout heat racing. I think the technical term is a "cowboy up" racing surface! 3nz Jamie Fox won the pole shuffle and chose the outside, leaving 1nz Bunter Pierce to take the pole. 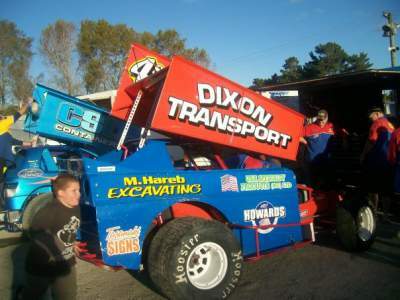 119h Brad Lane and 78s Shaun Bloeman were row two. 36a Phil Crumpe and 193h Syd Ferguson were row three. Others to watch included 54gm Steve Thompson from grid 8. Thompson won his opening heat but a DNF second time around curtailed his chances of a good starting spot. 5gm Brandon Parkinson was off 12 and 89a Luke Brown from 14 having failed to finish a race. Fox and Pierce went at it from the drop of the green. Fox up high on the track and Pierce down low. Coming off turn two they were side by side but Fox had slightly superior momentum to take the lead heading into turn three. Fox maintained his interest in the higher, slightly smoother line while Pierce was intent on utilising the lower reaches of the track through the rough stuff. The mover in the early stages was Ferguson who occupied the fourth spot after executing a pass on Lane. All drivers were having difficulty negotiating the track but it was sure exciting for us fans! 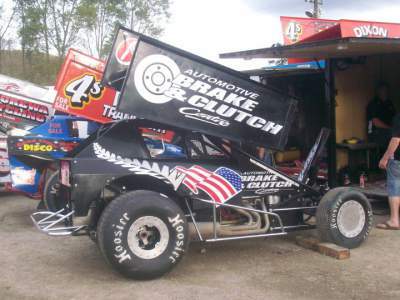 The first stoppage took place on lap four, 71s Carl Hinton high and dry in Pit Bend. He was able to restart from the rear. The race went into a long green flag period where the action was of the highest quality. Fox and Pierce resumed their battle for the lead with the same lines as the early stages. Inch by inch Pierce got closer and closer until he finally made the pass for the lead. Once passed Fox persisted with the high line, falling back into the clutches of Bloeman. Faced with dropping to third in the running order Fox would relent, heading down the race track. Early mover Ferguson fell back through the field as Lane and Thompson made a couple of moves. 12s Jason Kalin was another moving forward whilst Parkinson finally started to show what he can do, elevating himself into the mid-pack. Unfortunately for Parkinson he would puncture a right rear to end his night. From around the halfway point Lane made his move. The always exciting driver got by Bloeman for third before closing the gap to Fox. In a move of some irony it would be Lane up high as he executed a magnificent pass around Fox exiting Cemetary Bend. The Lane car had real attitude through the corners. Both Lane and Fox would close the gap to Pierce. However Fox was stuggling through the middle of Cemetary Bend and couldn't maintain the same level of pace. Lane closed the gap to Pierce with less than 10 to go and we had the battle that would surely define in the 2017 Super Dirt Cup. The lead duo were quickly approaching a gaggle of lapped cars and it all happened when they converged. Lane went high through Pit Bend, getting around the outside of Pierce to take the lead. However Pierce had other ideas. He got a good run off the corner to split Lane and a lapped car down the front straight. With two battling lapped cars in front of him Pierce turned right to try and round them. Only problem was Lane was still there! Lane was sent up the wall and somehow managed to avoid an expensive crash. Lane was out and wasn't looking particularly happy about it. I can't blame him. Pierce was not sent to the rear as prime cause which in my mind sets a fairly confusing precedent for what is and what isn't prime cause. Pierce led away from the restart with 7 laps to go. Coming out of two Pierce got sideways which allowed Fox around the outside and into the lead. It was like the opening few laps with Fox up high and Pierce down low. However the result would be different as Pierce would break his steering driving through the Cemetary Bend ruts. Pierce driving up the wall and over to his side. 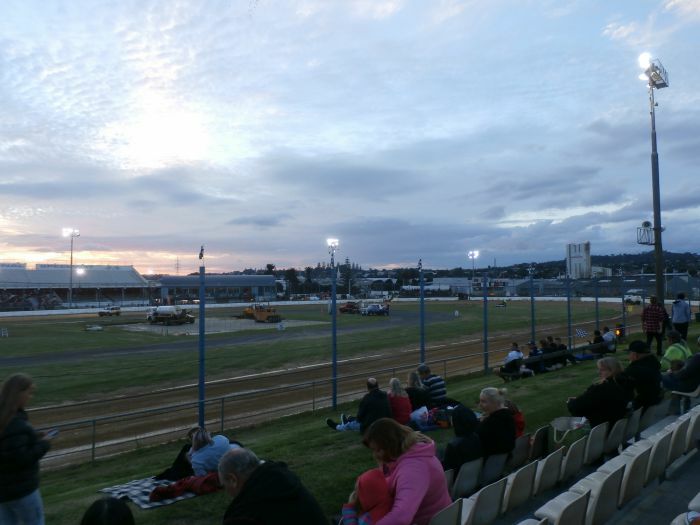 Once extracted the Auckland crowd gave a generous round of applause for the show the New Zealand champion had put on during the preceding 25 or so laps. There were only five cars left for the final few laps. The laps would pass without much drama. 3nz Jamie Fox winning his ninth Dirt Cup from 78s Shaun Bloeman and 54gm Steve Thompson.